We’d love your help. 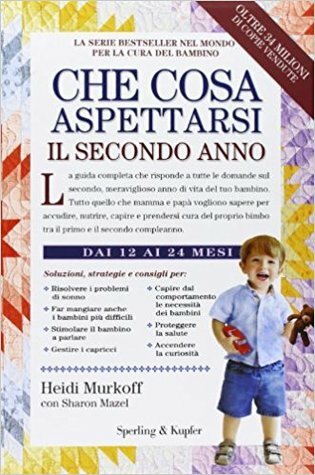 Let us know what’s wrong with this preview of Cosa aspettarsi il secondo anno by Heidi Murkoff. To ask other readers questions about Cosa aspettarsi il secondo anno, please sign up. A helpful and informative guide to all the developmental milestones and issues a parent will come across with their child from age 1-2. It is a very detailed book covering all areas of interest. There is nothing unexpected as advice. It is all common sense. Though, it helps to confirm what is normal. I was a huge fan of the "first in the series," if you will. I read it cover to cover. This time around I still read cover to cover but I barely finished before my daughter's second birthday. I'd highly recommend treating this as more of a reference manual: "Oh god, she's whining again, what are we supposed to do?" It was comforting, though, to read and re-read and re-read the section on language delay and be reminded over and over again that kids develop at different speeds. All parents need som I was a huge fan of the "first in the series," if you will. I read it cover to cover. This time around I still read cover to cover but I barely finished before my daughter's second birthday. I'd highly recommend treating this as more of a reference manual: "Oh god, she's whining again, what are we supposed to do?" It was comforting, though, to read and re-read and re-read the section on language delay and be reminded over and over again that kids develop at different speeds. All parents need something different from their parenting books, I suppose. I won't be continuing in the series. I think at this point I'll rely on web advice and parent-to-parent, but I don't regret the time I invested in this book. This was a great book that I always found very helpful in alleviating anxiety. Reading about things as normal that you're bothered by from new parent ignorance is really calming and reassuring. My only regret was I was often behind in reading the material relevant to the month of age. I would then get to a key point and think, "man I wish I would have known this a couple months ago!" The only thing that keeps me from giving it a 5 star is that I wish the author would have had more ref Read ahead! One of the unfortunate things about moving past the first year is that none of the toddler books are organized month-by-month, but tend to be by subject. Oh well. This book was and will be pretty useful. I've just finished reading/skimming it straight through, but I expect to reference it often for the rest of the year. It's helped confirm some of the stuff I was already doing and given me some pointers about dealing with my son's eating and playing. This book was great. The only reason I didn't give it five stars was that it was not as helpful as the "expecting" and "first year" books, which was not the fault of the authors. In the aforementioned books one can follow along as baby develops while also using it as a reference book. This version does not follow development, but rather divides chapters into sections on topics such as eating or movement. I used it more as a reference guide. I would recommend it to a parent of a toddler. I read about three quarters of this cover to cover, but unlike What to Expect When You're Expecting I think this is more of a, looking things up when you have questions or want to learn more about something, kind of book. I'm sure I'll continue to use it as my little one heads towards the end of his second year. This is an extremely helpful, good to have around book. Commonsensical, organized well, comprehensive in scope. As with the First Year book in this series, I like that the pages of the “what to do for injury or illness” chapter are outlined in grey for easy locating. I liked that there was no timeline for everything. I just read what I needed or what my cutie acted like/did and then I was good. Information easily accessible and navigation was a breeze to just read what you needed. I really like the set up of this book. The first in the series went through each month and what to expect. This book is set up with different sections making it easy to read through it all once, and then go back to certain chapters as needed. A nice overview of what to expect in the 12-24 months. A very useful section on common ailments and when to call the doctor. Definitely don’t read it cover to cover. There’s a few useful text boxes about common developmental milestones and how they range. But a lot of it reads like ways to assure worried suburban parents. Comprehensive, as usual. Very informative. I like that it was grouped by theme rather than by age. Again, a lot of good information! Time to get the next book! This was a helpful book. I liked that it was just set up in topics rather than month by month like The First Year. That was helpful then, but it was much easier to just focus on one subject at a time at this point. Very useful info for this first-time mom! Thank goodness we're no longer breaking things down month by month because that was kind of driving me crazy with the What to Expect First Year book ("My baby is...doing that! Whew! Oh crap, but she's not doing that other thing you say she should be doing. Is my baby normal or not? What does next month say??"). Instead we have sections like Feeding, Behavior, Disciplining Your Toddler, etc. Some things still stand out as being overly cautious to me, and I really want to see the studies that back Thank goodness we're no longer breaking things down month by month because that was kind of driving me crazy with the What to Expect First Year book ("My baby is...doing that! Whew! Oh crap, but she's not doing that other thing you say she should be doing. Is my baby normal or not? What does next month say??"). Instead we have sections like Feeding, Behavior, Disciplining Your Toddler, etc. Some things still stand out as being overly cautious to me, and I really want to see the studies that back up this: "[A] 2-hour-per-day TV habit translates to a 20 percent greater risk of an attention disorder." Whhhhhaaaat? Way to scare the crap out of me, Heidi Murkoff. But other parts of the book were really helpful and soothing in its common sense. Like how to shop with a toddler! Something I didn't think I needed to read until the day my toddler was running up and down aisles to get to the giant inflatable Santa at the front of Wal-Mart, ignoring me completely and my pleas that we had to get our shopping done before everything melted. And then we got to the car with our shopping done and she didn't want to get in her car seat for 10 minutes. Ahhhh. Well, the book is great. Specially in the sense that it is not like a "manual". It is just a collection of an expert's notes based on experience. The writer will keep telling you that the best rule is that "there is no rule" and that every toddler is unique in his/her own way. These sort of books just draws a VEEEEEEEEEEEEERY broad line for a mother. Dear mothers to be, read quickly before you have your baby. Once you have it you will find it very d Well, the book is great. Specially in the sense that it is not like a "manual". It is just a collection of an expert's notes based on experience. The writer will keep telling you that the best rule is that "there is no rule" and that every toddler is unique in his/her own way. These sort of books just draws a VEEEEEEEEEEEEERY broad line for a mother. If you really want to make use of this book and its similars, just read them as soon as you think that "one day" you will become a mother. You will grasp the logic, and keep it in your library as a reference. Once you need it, you will know how to find your way into the book to the point of concern. For me, I started reading, and ended up just skimming through so that I make sure I do not miss an important point that I still need to learn about! The top line: If you're a fan of the month-by-month parenting book organization, this isn't the book for you. Me? I prefer to dig in and read cover to cover, rather than parse out a chapter or so a month. The topical organization (e.g., full chapters about traveling with a toddler, sleepy time, emergency care) provides more information on each subject in one place. No more thumbing through the index! And, yes, there are toddler timelines and developmental milestones, too! They are just rolled in The top line: If you're a fan of the month-by-month parenting book organization, this isn't the book for you. Me? I prefer to dig in and read cover to cover, rather than parse out a chapter or so a month. The topical organization (e.g., full chapters about traveling with a toddler, sleepy time, emergency care) provides more information on each subject in one place. No more thumbing through the index! And, yes, there are toddler timelines and developmental milestones, too! They are just rolled into the first chapter. If you read What to Expect When You're Expecting, you may be concerned about one thing: an alarmist perspective. Never fear! The content and advice seem to be broadly applicable, not sensational or exceptional. For example, with missed milestones, Murkoff advises parents speak with the pediatrician, but keep in mind that children develop at different speeds--excel in one area and then play catch up in the next. That is not to say she does not cover difficult subjects such as emergency care and developmental disorders, but the advice is practical, and the tone is compassionate. The "When to Call the Doctor" section is particularly useful--this alone is worth having the book on hand. I've read numerous books in the "What to Expect" series, and with each one, I find myself getting increasingly annoyed with the euphemisms and cutesy language. I want quick, straightforward answers and advice, and this book takes its sweet time getting to the point. Also, much of this book is geared toward the 18-24 month set. It was nice to see a heads up of what to expect (heh) in the coming months, but a lot of it isn't applicable to my 13 month old toddler (dressing himself, using utensils, e I've read numerous books in the "What to Expect" series, and with each one, I find myself getting increasingly annoyed with the euphemisms and cutesy language. I want quick, straightforward answers and advice, and this book takes its sweet time getting to the point. My favorite part of reading this book was the time-line of advancements for toddlers for each month. It kept me on cue as to where my toddler should be and how I can help him to advance. Mostly everything else was self explanatory, common sense stuff for me. I helped raise most of my nieces and nephews, so I pretty much knew most of the stuff written. But, ever now and then, I would find something useful. The first book was more helpful. I absolutely loved the month by month guidance of What to Expect the First Year. I expected the same from this book and honestly I feel like this book was somewhat just an attempt at making more money off of this successful franchise. There is some helpful information in here but nothing I could not have found (even more quickly) than googling an issue if I had it. I will definitely re-read the first two books the next time I have a baby, but not this one. This is not a month by month guide like the prior What to Expect books. I paged through it and was able to get some kindly reassurance, which, let's face it, is what you probably need as you're dealing with a toddler. I was able to quickly get the info I wanted, and I think it was written with the understanding that parents are less terrified at this point, but they still have fears and questions. Another awesome read by Heidi!! This was...fine. I was hoping it would be in the same month-by-month format as the previous books in the series, but I understand that it's hard to make such generalizations when kids vary so much in their development and habits at this age. While I did take away a few tips and tricks, so much of it is self-explanatory and a bit fear-monger-y...would only recommend reading this if you are someone who is very secure in your parenting skills. Heidi Murkoff is the author of the What to Expect® series and author of Eating Well When You're Expecting, The What to Expect Pregnancy Journal & Organizer, What to Expect the First Year, The What to Expect Baby-Sitter's Handbook, and the What to Expect Kids series from HarperCollins. Her interactive website is www.whattoexpect.com, and she lives with her family in Los Angeles, California.